HISTORY is not a topic that seems to interest many people these days, and if most Hawaii residents know of Princess Ruth Ke'elikolani at all it's because of a photograph that shows a large grim-looking Hawaiian woman standing stiffly in formal 19th century attire. Only eight or nine photos of her are known to exist. » Screens at University of Hawaii Art Auditorium, 2535 McCarthy Mall, 7:30 to 9 p.m. Thursday. Admission is free. » The program will also air PBS Hawaii at 8 p.m. June 9 and 12 for the English version, with the Hawaiian version following at 8:30 p.m.
"The two things people usually know about her is what she looked like -- which a lot of people seem to remember -- and maybe that she had something to do with the Bishop Estate having a lot of land," said Craig Howes, of the University of Hawaii at Manoa Center for Biographical Research. Howes is series scholar for "Biography Hawaii," a project document ing the lives of historical figures deemed to have had an enduring impact on Hawaii, and make their stories available as PBS specials, on video and DVD. The aim was not to pick the usual suspects, characters most already know a great deal about, but six people whose stories would help us "find out something about the history of Hawaii," he said. "Rather than go with Kalakaua or Lili'uokalani, we thought, why not her? Everybody has a notion about her but nobody really knows a heck of a lot about her." Ke'elikolani is the third person to be profiled by Howes, director/editor Joy Chong-Stannard and writer Victoria Nalani Kneubuhl. Earlier programs covered Maiki Aiu Lake and attorney Harriet Bouslog; future programs will explore the lives of Stanford B. Dole, Prince Jonah Kuhio Kalaniana'ole and Koji Ariyoshi. "Biography Hawaii: Ruth Ke'elikolani," will be introduced in two free screenings on Thursday at the UH Art Auditorium. It will also air on PBS Hawaii on June 9 and 12. Howes feels it's time that Ke'elikolani gets credit for her efforts to defend Hawaii and its culture, and for maintaining intact the vast land holdings that became the foundation of Kamehameha Schools/Bishop Estate. The program has been produced in English and Hawaiian versions. English narration is by Ka'upena Wong, Ku'uipo Kumukahi narrates in Hawaiian, and Tammy Haili'opua Baker provides the voice of Ruth, who bequeathed almost all her land holdings to her cousin Bernice Pauahi Bishop. "(Ke'elikolani) was of the Kamehameha line, and you can see from the show that she really tried to keep (their lands) together," Howes said. Had she been less aggressive in asserting her claims or less astute in her ability to maneuver through the western legal system, much of the land now owned by KSBE might have been dispersed. The program benefits from commentary from UH professor of Hawaiian language Puakea Nogelmeier, UH-Hilo director of Hawaiian Studies Kalena Silva, and UH professor of Political Science and Hawaiian Language Noenoe Silva, who assess Ke'elikolani's place as a mover and shaker among the mid-19th century ali'i, and the ways in which her resistance to foreign ways make her significant in influencing Hawaiian thought today. Ruth Ke'elikolani's Victorian mansion was larger than 'Iolani Palace. Ke'elikolani inherited Western-style "palaces" from her father and first husband, but preferred to live in a traditional-style Hawaiian grass house adjacent to her beachfront palace in Kailua-Kona. 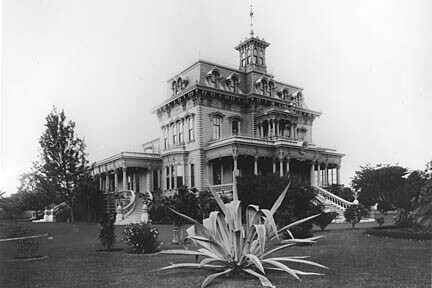 However, in Honolulu, Ke'elikolani's Victorian-style mansion, Keoua Hale, was larger and more massive than 'Iolani Palace. Could the size of the place -- which was allowed to deteriorate after her death and eventually destroyed to make room for Central Intermediate School -- been a way of subtly diminishing the stature of the ruling Kalakaua dynasty in comparison with that of the Kamehamehas? "It would be pretty hard to imagine how (the house size) wouldn't make some kind of a point (but) there are a number of theories on this. That's one of the suggestions; we bring it up, but very carefully," Howes says. 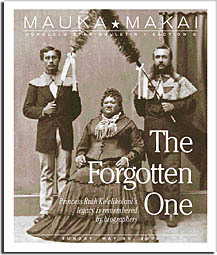 Nogelmeier mentions in the program notes that although Ke'elikolani's lineage was questioned, she was recognized as a member of the royal family and the royal court until the death of her half-brother, Lot Kapuaiwa (Kamehameha V). When William Charles Lunalilo, who was of Kamehameha lineage through his mother, Kekauluohi, was elected king in 1873, he also proclaimed Ke'elikolani to be a member of the royal family and the court. Nogelmeier writes that David Kalakaua did not extend this courtesy to Ke'elikolani when he was elected to the throne, even though Ke'elikolani was the adoptive mother of his younger brother and heir apparent, William Pitt Leleiohoku. Nogelmeier describes this as "a slight that was highly contested in the newspapers of the time, and that was not forgotten" by Ke'elikolani. There was political rivalry as well, Howes notes, pointing out that Ke'elikolani ran against Lunalilo and Kalakaua in the election that put Lunalilo on the throne. Kalakaua later won the election that was necessary when Lunalilo died heirless a year later. Riots broke out when supporters of candidate Queen Emma, the widow of Ke'elikolani's half-brother, Alexander Liholiho (Kamehameha IV), disputed the results. 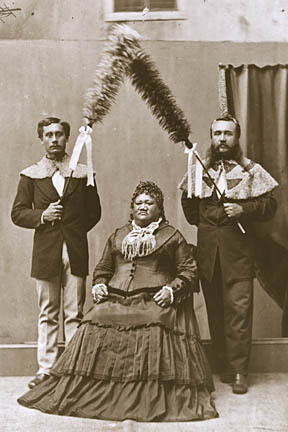 With tension between the Kalakaua and Kamehameha lines, Ke'elikolani demanded that Kalakaua and his family formally relinquish claims to the lands that she had given her adopted son Leleiohoku after he died in 1877. Howes sees this as a pivotal moment in Hawaiian history. Had Leleiohoku lived to become king in 1891, he would have also been the wealthiest man in Hawaii. "The fact that Kalakaua ended up as king without the same kind of resources (Ke'elikolani had) was one of the main problems of the time. (Kalakaua was) continually having to draw on the legislature to get money (for the government) -- building the palace, for example. Ke'elikolani had the resources herself -- they were personal resources -- and the thing that is really really sad about (Prince) William Pitt Leleiohoku dying, was that from what we can figure, she set up a deal where the person who was going to become king (after Kalakaua) was also going to become the most independently wealthy person in the island. He would have ended up with the resources to be able to tell the legislature to go stuff itself at various points." A financially independent monarch would have been a more difficult target for the enemies of Hawaiian freedom to overthrow. Lili'uokalani, who was forced to deal with the same financial problems that had plagued Kalakaua, died in 1917 at the age of 79, and so it is certainly possible that Leleiohoku, who was born in 1854, could have reigned as the monarch of a free and independent Hawaii until the early 1930s. On the cover: Princess Ruth Ke‘elikolani is the subject of a “Biography Hawaii” documentary to be screened at the University of Hawaii at Manoa and aired on PBS Hawaii. THE ENGLISH-language newspapers of the time -- which often served as conduits of anti-Hawaiian propaganda -- rarely had much to say about Princess Ruth. Howes, Kneubuhl, Nogelmeier and other members of the biography team, found Hawaiian language newspapers far more useful. "(The ali'i) got into really contentious legal battles with each other," Howes said, explaining that the sworn testimony and related legal documents provided a wealth of information about Ke'elikolani and her relationships with other ali'i. For instance, Ke'elikolani adopted Leleiohoku "legally" (under western law) through documents filed at the Bureau of Conveyances and through the process commonly described as hanai. The issue of her paternity was also litigated when she sought to inherit the lands and property of Kekuanao'a, who had publicly recognized her as his child by his first wife, Pauahi, who died in childbirth. 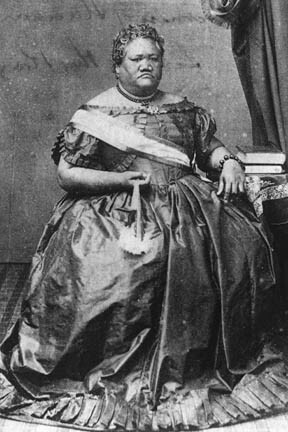 Ke'elikolani's half-brother, Lot Kamehameha, regarded her as the natural child of Kahalaia, and claimed that Pauahi was already pregnant when she married Kekuanao'a. This alternative lineage would have made her a great-granddaughter of Kamehameha I, but would have removed her as a claimant to Kekuanaoa's lands and property. The decision to produce the documentary in two languages instead of one cut the running time of the biography in half and forced Kneubuhl to make some tough content choices. There is much more to the story of Ke'elikolani's relationships with her husbands, William Pitt Leleiohoku (who died at age 22) and Isaac Young Davis (whom she divorced after she hanai'ed their son, Keolaokalani, to Bernice Pauahi), than Kneubuhl had time to cover in 26 minutes and 46 seconds. "It's clear that the relationship (with Davis) was contentious, and I think it's also clear that she didn't back down very often in her life," Howes said, who suggested that Davis may not have been quite the cad portrayed in an account of the marriage. "Clearly, (Ruth's) a figure that we're trying to present positively," Howes said. Such editing choices aside, the program is a thought-provoking look at a fascinating woman who deserves more recognition these days than she generally receives. Although it seems certain that Ke'elikolani was as fluent in English as other ali'i of her time, anyone who did not speak Hawaiian was required to provide a translator if they wished to converse with her. Born in 1826, and raised at the time when the early missionaries and their native Hawaiian acolytes were destroying much of Hawaii's traditional culture, Ke'elikolani remained true to her heritage. She was a patron of chanters and hula dancers, perpetuated the protocols traditionally accorded an ali'i of her rank, and observed customs denounced as "pagan" by enemies of the Hawaiian people. Kalena Silva writes that although many see Ke'elikolani's decision to bequeath the bulk of her estate to Bernice Pauahi Bishop as her "great life achievement," many others now "take great inspiration from Ke'elikolani's personal courage" in her uncompromising loyalty to the culture and language of her ancestors.